We are delighted to be able to announce a major new co-production with Liverpool Everyman & Playhouse. Spymonkey’s ‘A Christmas Carol’ will play a five-week run at the Playhouse from 8th December – 12th January. 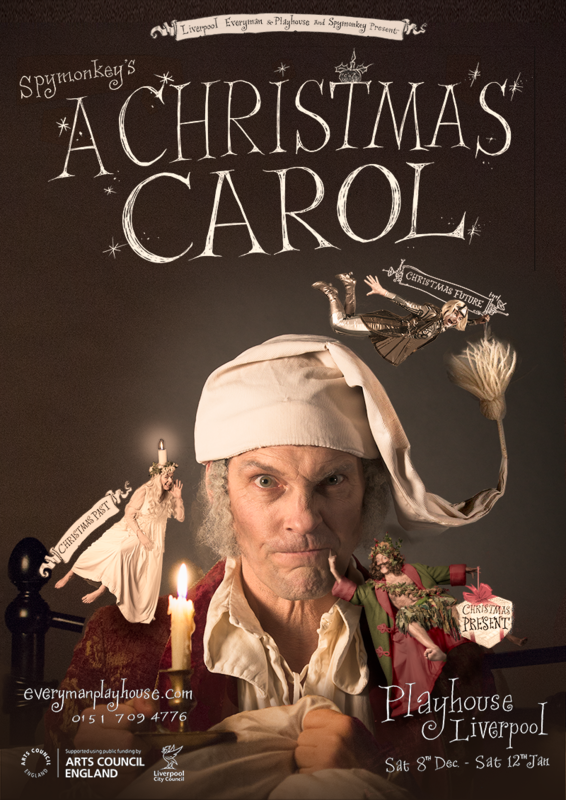 The perfect Christmas show for lovers of laughter, music and Charles Dickens’s greatest story, brought to life in splendidly festive fashion by those artists of comedic invention and madcap delight, Spymonkey. Toby Park, Petra Massey, Aitor Basauri and Sophie Russell, alongside director Ed Gaughan, designer Lucy Bradridge and a musical line-up including Ross Hughes and Marcus Penrose, will reprise the creative team behind the sell-out success of Mrs Hudson’s Christmas Corker at Wiltons Music Hall London in 2014. Don your best Victorian bib-and-tucker and hold on to your stovepipe hat, as you’re whisked through Victorian London and beyond, led by the Ghosts of Christmases Past, Present and Future on a flight of theatrical fancy. ‘Not that far back, you irrepressible comedy loons!’ Mr Dickens would surely protest. ‘I’m pretty sure the Nativity story did NOT make an appearance in my Christmas Carol!’. ‘No matter!’ Scrooge will say, dancing a jig through the frozen streets, dressed only in his nightshirt, as he finally understands what Christmas is all about. And so, good friends, will we – with a tear in our eye, clutching our loved ones close about us and counting our many, many blessings! And one of those blessings is sure to be: Joining us at Liverpool Playhouse for this riotously good-natured musical comedy treat. Bless my jiggit! We are also delighted to be cooking up some cool stuff with illustrator Chris Riddell, which we will be releasing alongside the show.